The Wisconsin and Southern's Southern Division, or as some still refer to as �the Wicket�, hasn't always been part of the original WSOR family. It started in the same state of despair as the Northern Division was with the Milwaukee Road looking to abandon hundreds of miles non-profitable lines in Wisconsin. Several railroads attempted to revive the lines including the Chicago Madison and Northern, Central Wisconsin and the Wisconsin & Calumet. On August 21st, 1992, the Wisconsin and Southern took over operations of the Southern Division and has flourished since. 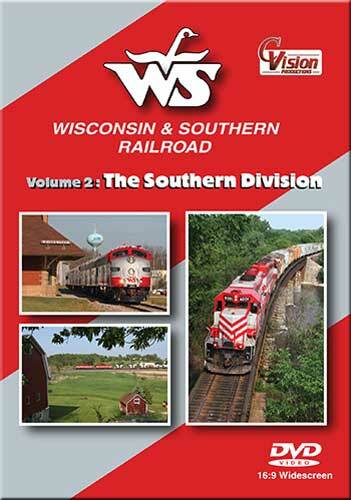 In this volume, we take a look at the WSOR's Southern Division that includes the Waukesha, Reedsburg, Watertown, Fox Lake, Madison and Prairie Subdivisions. We also view trackage rights trains on the CN's Waukesha Sub and over the Canadian Pacific in Milwaukee. Many colorful WSOR trains are captured across the states of Wisconsin and Illinois led with SD40-2's and GP38-2's. Also included are recently acquired units from the BNSF and N de M. And we capture more action of an inspection train with the WSOR's elite E-9's! From the rich, fertile farm fields to the bustling cities of Chicago, Milwaukee, and Madison, you will enjoy watching this vibrant regional railroad working across America's Dairyland! R. Nelson (northern Illinois) on 2013-05-19 16:16:22. I had purchased both DVDs, Vol. 1 "The North Division", and Vol.2 "The Southern Division". Both are very good, with exceptional coverage of operations, and excellent camera work. I had previously bought the Plets DVD covering the Wisconsin and Southern, and was very disapointed. Chris at C. Vision did a knockout job on these two programs, and I highly recommend both DVDs to anyone with even a passing fancy of the W&S. Bob (chigago) on 2013-05-18 09:25:26. Was really good. Wish it showed Fox Lake. Found it interesting. Like the Wisconsin. Southern.